Head Coach Eric Wolford prepares the team prior to kickoff. 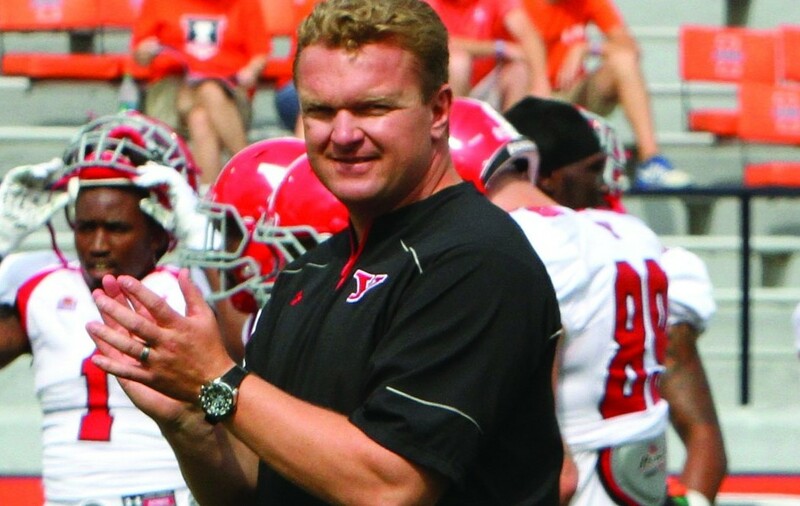 YSU struggled last year with a record of 1-3 during November. The Penguins were eliminated from the playoffs during the final week of the season. Photo Courtesy of Sports Information. The Missouri Valley Football Conference is at an all-time high, and is by far the best conference in the Football Championship Subdivision. Going into last Saturday’s games, seven of the league’s 10 teams were ranked, with nine receiving votes to be ranked — including the FCS’s number one ranked team and three-time defending National Champion North Dakota State University. The league as a whole showed its dominance during non-conference play this season. The conference went a combined 23-1 against FCS opponents this season — a conference record. “This is a tremendous league. You have to come ready to play every weekend or your going to get beat. 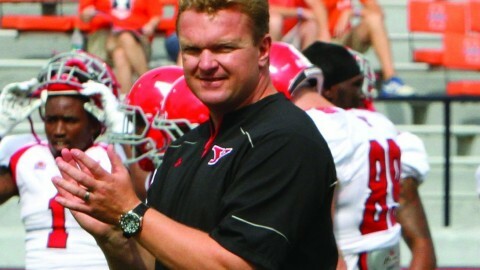 There isn’t a team in this league that can’t beat us,” Illinois State University Head Coach Brock Spack said. Six MVFC teams are ranked in the top 100 of the Division 1 Sagarin rankings. The Sagarin ranking is a ranking of every team in Division 1 football, both FBS and FCS. North Dakota State University is the FCS’s highest ranked team coming in at 34. Youngstown State University just cracked the top 100, coming in at 98. 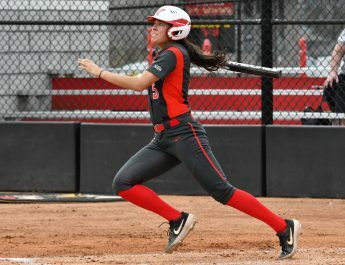 YSU is 3-1 against the rest of the conference this season and has three wins against ranked opponents, including a 30-27 win last weekend against 13th-ranked South Dakota State University. YSU’s only loss came against unranked Western Illinois University. YSU has four games remaining on its schedule, and the final three games are against ranked opponents No. 22 Indiana State, No. 9 Illinois State and No. 1 North Dakota State in the last game of the season. In order for the Penguins to make the playoffs they will likely need to win at least two, if not three, of their remaining four games. “We’re just taking it one game at a time. We play South Dakota next and we’re just going to go in on Monday, get the corrections handled, and then start focusing on South Dakota because we know that’s just another team in our way, and we’re just trying to go 1-0 each week,” YSU safety Donald D’Alesio said. The Penguins take on unranked South Dakota University this upcoming Saturday. South Dakota is the only team in the MVFC that did not receive any votes to be ranked and are 0-4 in conference play this season. Some might see the South Dakota game as the easiest game left on the YSU schedule, but Coach Wolford knows that there is no such thing as an easy week in the MVFC.